Indiana’s week 1 victory wasn’t dominating, but it was a victory nonetheless. Among the positives: 2 solid quarterback showings, Reece Taylor’s two-way performance and a defense that recovered 3 turnovers. Among the negatives: a defense that allowed too many big plays and a running game that struggled at times. Let’s get to this week’s recap. Cole Gest started and had 2 carries on Indiana’s second drive. [ref]There were no rushes on the opening drive. [/ref] Gest, freshman Stevie Scott and Mike Majette rotated on Indiana’s next possession, an 11-play, 68-yard drive ending with a touchdown. Unfortunately Gest was injured on the drive leaving Scott to do the majority of the work the rest of the way. Scott received 20 carries, rushing for 70 yards. While the 3.5 yards per carry average is low, he did have a 45% success rate, well above the 20% by Gest and Majette. For comparison, Morgan Ellison had a 47% success rate last year. Sure the competition was not elite, but it was an encouraging sign for an running game that, outside of QB and WR rushes, left something to be desired. If anything, it was a little unusual, after the Gest injury, that we didn’t see Ricky Brookins or Ronnie Walker. One negative was that Scott’s longest rush was only 9 yards. Had it not been for the final, time-killing drive, this one might have gone to the overs. But that 11-play, 43-yard drive saw Indiana call 10 rushes and 1 pass. Overall, both quarterbacks played well. Ramsey was 20 of 27 for 156 yards, 3 touchdowns and 1 interception. Penix was 8 of 10 for 96 yards and a touchdown. On passes, Penix had a success rate of 70% versus 52% for Ramsey. In terms of Equivalent Points per Play (PPP) including turnover PPP, Penix was at 0.92 versus 0.37 for Ramsey. For reference, Ramsey averaged 0.46 last year. [ref]Lagow averaged 0.48[/ref] Ramsey will obviously start against Virginia and Penix should play. While Penix only had 10 pass attempts, his performance suggests, at minimum, there shouldn’t be any drop off if Ramsey has to miss any time, and there could be upside for much more. 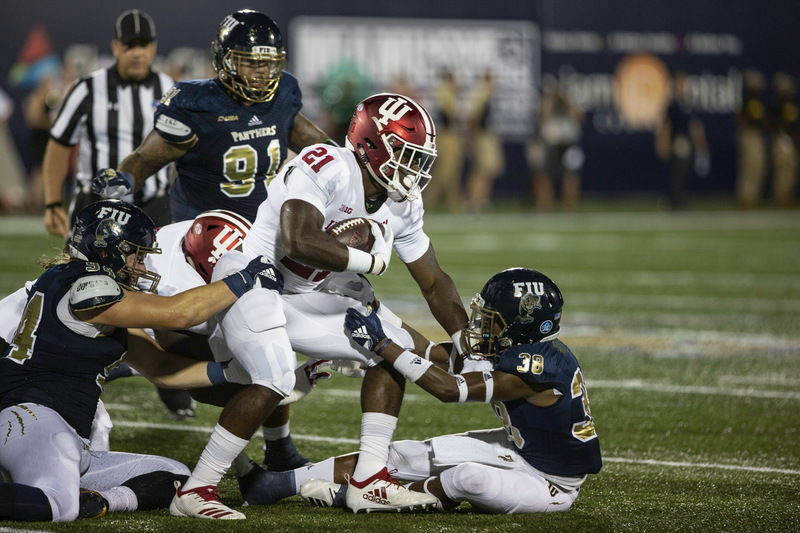 The Indiana front 7 was pushed around in the FIU running game. In 34 non-garbage time rushes, FIU was stopped for no gain or a loss just 3 times. In 2017, the lowest stuff rate was 10% against Ohio State. I don’t think the 2018 FIU offense matches the Ohio State offense from 2017 but time could prove me wrong. This is obviously concerning in addition to the FIU rushes of 18 and 36 yards. Against FCS Richmond, Virginia running back Jordan Ellis rushed 20 times for 146 yards, having just 1 carry go for negative yards. In addition, QB Bryce Perkins added 96 rushing yards on 10 carries once you factor out sacks. In other words, the Hoosiers better tighten things up this Saturday under the lights. Dameon Willis and Reakwon Jones started added 6 and 3 tackles, respectively. Thomas Allen and T.D. Roof rotated in and added 3 tackles each. In yesterday’s media session, Tom Allen expressed his displeasure with this position group. Allen: "I was really disappointed with the linebackers. We challenged them this morning in our meeting, challenged our defensive line." Listed in the participation report were freshmen QB Michael Penix, RB Stevie Scott, WR/CB/Fan Favorite Reese Taylor, TE Matt Bjorson, Husky Cam Jones, S Devon Matthews, CB Jaylin Williams, DB Jamar Jackson, and LB Micah McFadden. We’ve already covered Penix and Scott, but Reece Taylor was used in an exciting way on offense. He had 3 rushes for 40 yards and 2 catches for 12 yards. He also saw time on defense, making 2 tackles. Bjorson had a catch of 15 yards. Jaylin Williams made 2 tackles at CB. So far the 2018 class is making an impact. This one probably could have been more, but Indiana was in clock-killing mode. And it could have gone to the overs had Stevie Scott punched it in on the final play of the game, a 4th and 1 from the 2 yard line. In terms of equivalent points, Indiana played well enough to win by 25 points. After all, Indiana had 135 more yards and recovered 2 more turnovers including one that was returned for a touchdown.